Our last trip this fall was with Misty Mawn. I will be writing about it shortly, but Misty has posted a wonderful entry on her blog about it. Misty will be returning September 30 – October 6, 2012. Stay tuned to our website for details. 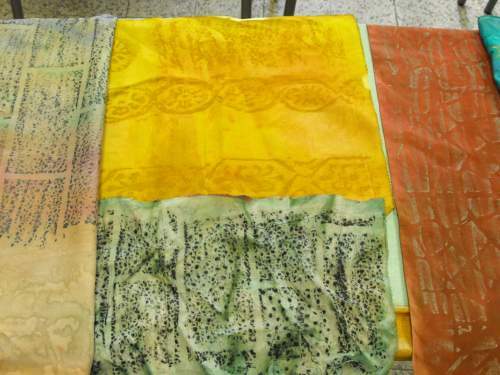 Australia’s Lisa Walton led a workshop for us at the end of September producing some beautiful dyed fabrics, beaded scarves and more. 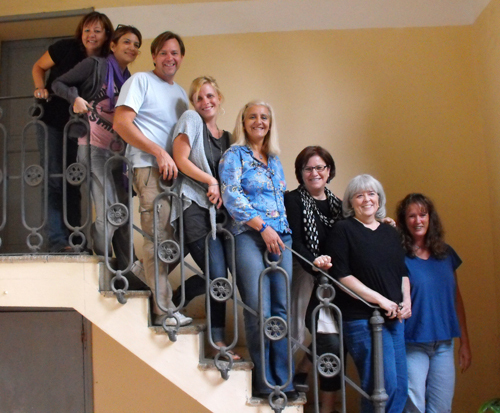 At the same time a Discover Orvieto group was out exploring the food, wine, oil and culture of Orvieto. The two trips yielded a raft of memorable experiences and products. students. It is exciting to know that some of these fabrics will be showing up in Houston in a year’s time. and cheese, and exploring the city to see why we love the medieval city form so much. wines in restaurants, and we dove underground into Etruscan caves that underlie the entire city. 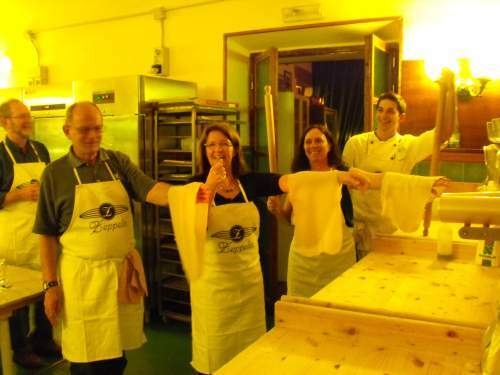 We also, as a group, spent a late afternoon and evening learning how to make pasta, sauces, breads, and desserts in a riotous cooking class. When done cooking we eat the food we have prepared! It was a great week. We so enjoyed this mostly Australian group, especially since our daughter is in graduate school there now! We’ll have friends to visit when we go to her graduation. 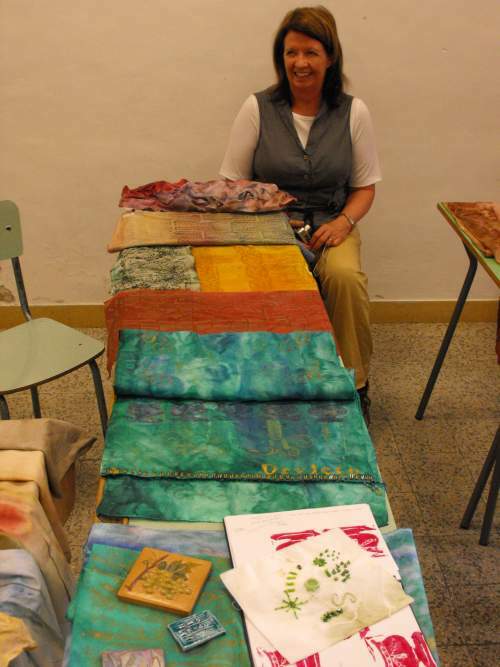 We are excited that Lisa has agreed to return to teach in 2012. Her dates are set – October 23 – 29, 2012. 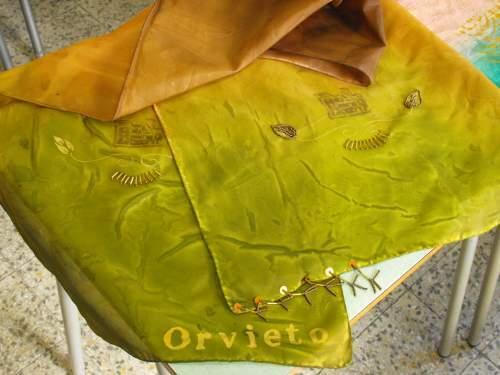 We’ll be looking forward to more scrumptious fabrics and products, and fun on the streets of Orvieto! 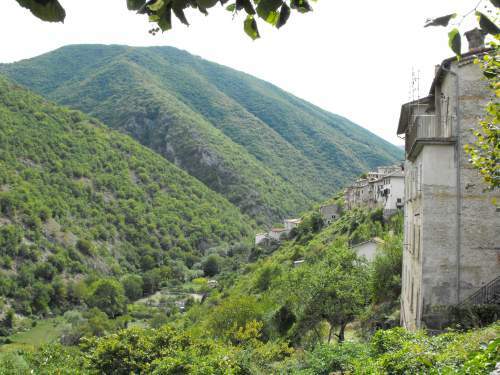 We are back just 12 hours from a month in Italy – 3 weeks with groups in Orvieto and one week in Abruzzo’s Sulmona. I come back humbled by the generosity of the people we know, generosity of spirit, friendship, and giving. These people and this place have profoundly influenced us for the good. We are so lucky. Our last day in Orvieto was beautiful. We had our last cappuccinos at Scarponis, savoring the wonderful flavor and soft texture of the foam. We gathered up cheese and salami from Carlo, our butcher, and the freshest of vegetables and fruit from our grocer for a picnic. We got one of the last loaves of fresh bread from Alessandra the baker. 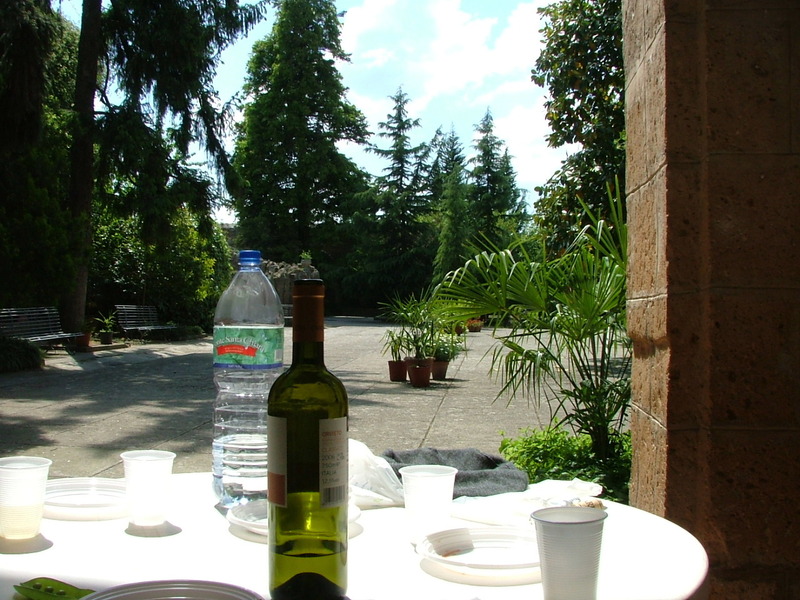 We saw Beth and Janice from our last group off to Rome before settling in to the loggia at our convent B&B under a warm fall sun to enjoy our picnic. We wandered the streets in the afternoon taking in the rich details that make it such a joy to be out on the streets. We had our last gelato, then tea sitting in Piazza Republica watching the passeggiata begin to unfold. Then the generosity of people began to emerge. We had asked our friend and ceramic artist Alberto Bellini to make us a sign for our new house “Wren Cottage.” We went to pay and he would only take 40 Euro for it. “It is my shop and I do what I want,” he said and would take no more. It is simply a steal. 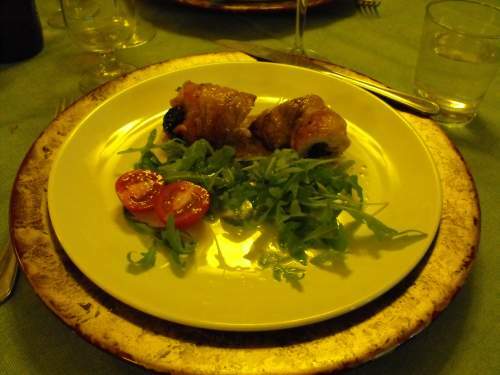 We returned to San Lodovico, our B&B, where Giovanna had a travel package of food to fortify us in the face of the dismal food we would receive on the long flight home. Off to dinner at La Palomba where we enjoyed the freshest of salads, the tastiest of vegetable soups, and the most tender succulent tagliatelle with wild boar. 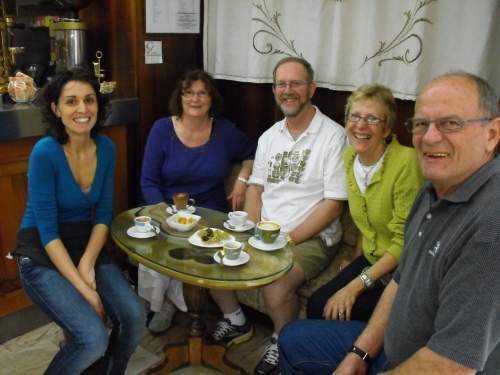 Gianpier, the owner, came over as we prepared to leave and said “ospitalita” – dinner was his treat. “Why?” I ask. “Why, yes,” he replies. The thing is, all this generosity is so common. And it leaves its imprint, for we return determined to show the same kind of generosity of spirit, friendship, and service that we receive in Orvieto. What a gift we have received from this beautiful place. Leaving the soft tuffa rock of Orvieto; the cozy, intimate streets; the bustling, pedestrian activity of the main streets; the urban character is not easy. Yet Orvieto, because it provided such a stark contrast to the suburban America we lived in until eight months ago, led us to find our new home. We leave the buttery stone of Orvieto for the green softness of our Blue Ridge foothills. Both are beautiful, and both are very different. 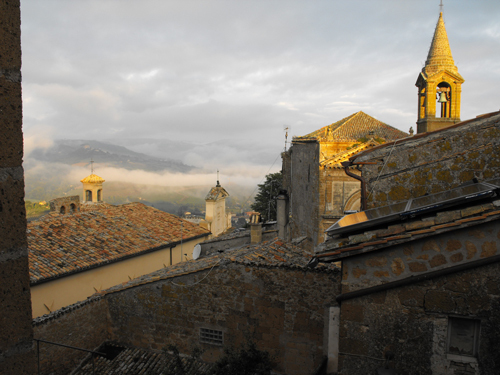 We return to small town USA with a similar richness to that of Orvieto. 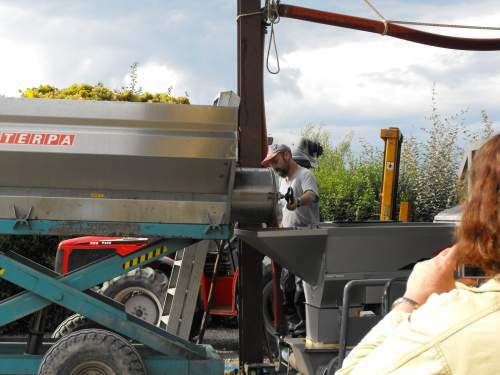 We have Orvieto and its people to thank for leading us here. It allows us to return, still sad to be leaving, but not morose at the prospect of months of the lifelessness that is suburbia. We return to a wonderful small town full of its own wonderful people and character. We return to the cappuccinos at The Grind matching Scarponnis in flavor. We return to merchants downtown who we can call by name and who provide personal service. 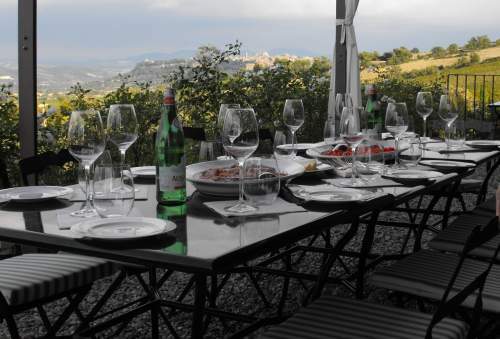 Orvieto has led us to search for and find some of what it offers here in the U.S. We are rich indeed. 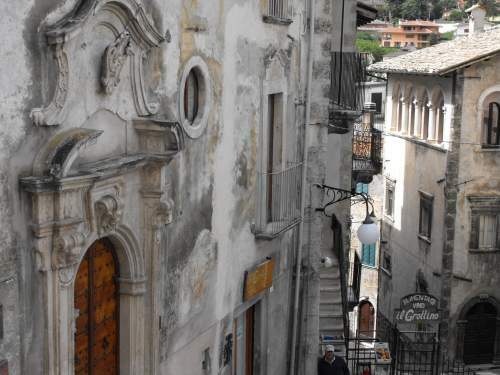 While in Sulmona we took a bus to Scanno, a charming town in the mountains sitting at about 3500 feet in elevation. 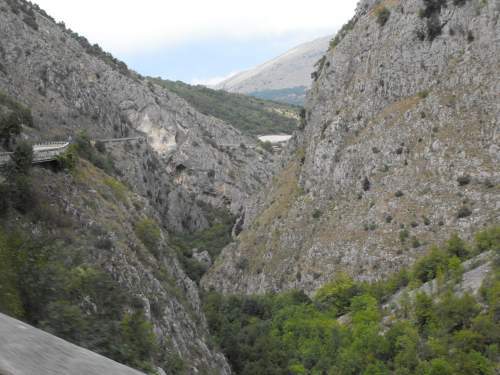 The ride is an exciting one, climbing through a narrow gorge with views of small villages perched on the edges of hills, and drops into the gorge at the road’s edge. 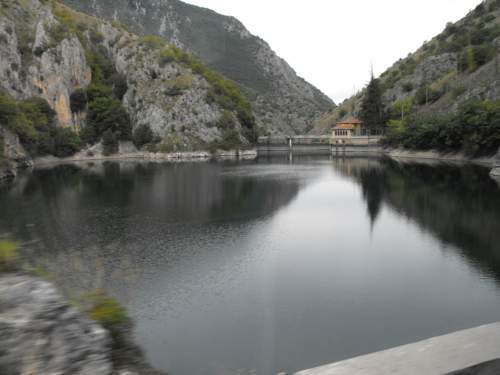 A lake sits at the foot of Scanno. The town itself is delightful. 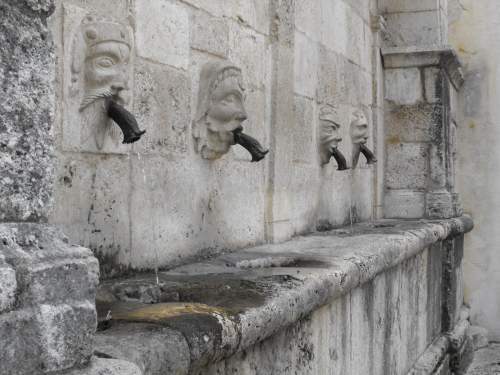 In this part of Italy the native stone is white. Buildings and streets are primarily this color. 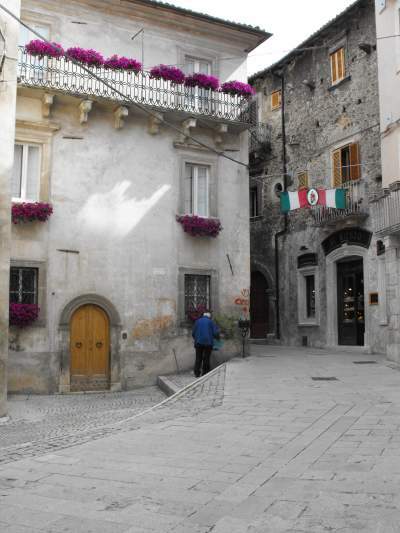 The piazzas are small creating pleasant spaces in which to gather. The narrow medieval streets curve and wind creating intrigue at ever corner. This is a town in which some women still wear traditional garb, though we saw just one. It is close to skiing in the winter and clearly a retreat in summer’s heat.